Strange And Pretty: Laquer Love: Zoya "Kelly". I never knew true love until I saw this nail polish. We all know how much I love greys/greiges, and this has always been the perfect nail polish color to me. Only problem is, I could never find it. But when I went to MadeYewLook's meet and greet at Ulta I finally found it. Since then, I've been wearing it nonstop. Like...the bottle is halfway gone. And I've barely had it a year. That's crazy for me when it comes to nail polish. 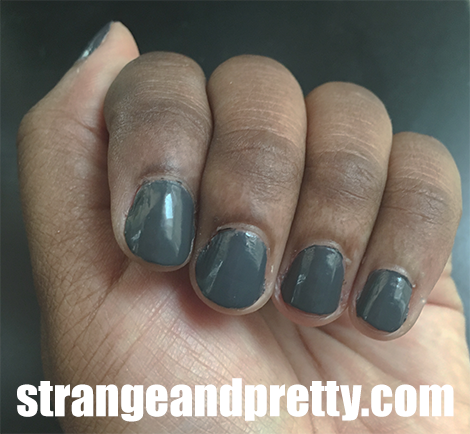 Zoya's Kelly is a dark grey creme with no shimmer or iridescence to it at all. It's just grey. The perfect grey. It's great when I've just worn a black/almost black polish, and I want to convince myself that I'm following that up with a NOT so dark color. Which it isn't - Kelly isn't one of those "you might as well have worn black" kinds of colors. You can tell this is grey and not black. And that's one of the reasons I love it. It's dark, but not aaaaallllll the way dark. I really need to get another bottle soon. And by "another" I really mean four.